Today, I have a small confession to make to my family in the Midwest. Although I grew up in the heartland of the meat + potatoes style of dinner, nowadays I cook meat-free meals more often than not. (Eek, shudder!) Hang with me a sec. These recipes are quick to make, and they are easy on the budget. Mainly though, I want to share these recipes with you because I love them and make them often! For me, meatless recipes have to meet certain criteria: they have to be simple enough for weeknight meals, be budget-friendly—as meatless meals often are (I can buy a lot of produce for the cost of chicken), and be constructed so you don’t miss the meat. So no renditions of cauliflower steak here. As a meat eater, I like vegetarian recipes that stand all on their own, i.e. ones that don’t attempt to substitute tofu or tempeh or lentils to imitate meat. Although the term ‘vegetarian’ is indeed the correct description for these recipes, I associate that word with the type of diet rather than a recipe. I prefer the terms meatless or meat-free I suppose. I am definitely not a vegetarian as I could never ever ever give up bacon, but I believe it’s important to focus more on the vegetables on your plate versus the starches or meat. As Michael Pollan likes to state, “Eat food. Not too much. Mostly plants.” It comes down to the small choices we make every day. Here are 9 of my favorite meatless meals, maybe for your first Meatless Monday or (obviously) for my vegetarian friends out there! Mexican food is perhaps one of the easiest things to enjoy free of meat. 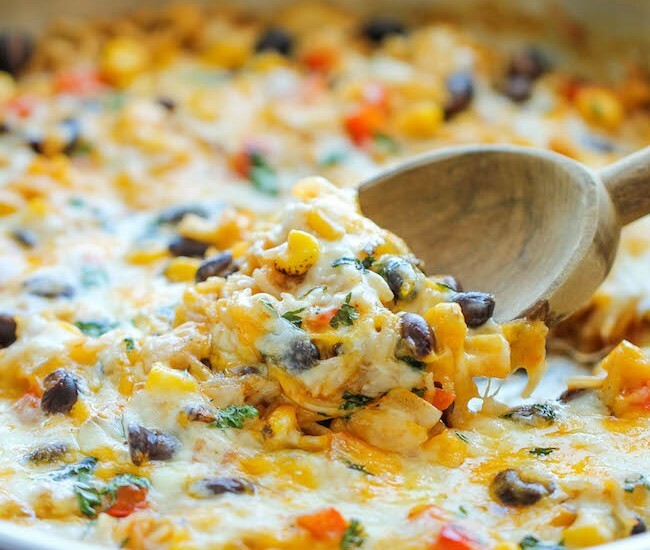 Perhaps a cheesy enchilada rice skillet. Or one pan Mexican quinoa (substitute brown rice for a more budget-friendly option). Pasta is also a simple way to go, but the same spaghetti with tomato sauce can become a bit of a snoozefest. 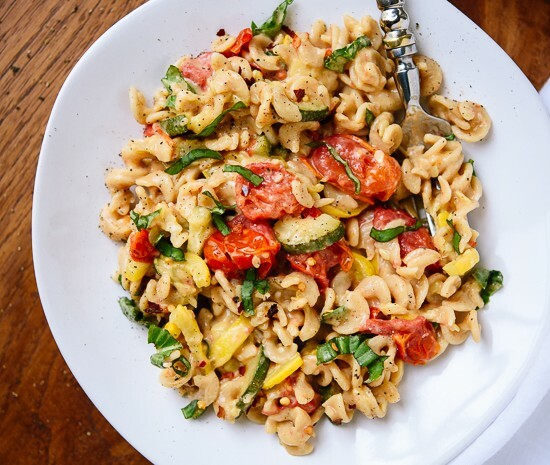 Try one of these for something new: Creamy Tomato and Summer Squash Pasta, Penne with Roasted Asparagus and Balsamic, or Mushroom Penne with Pesto (use any kind of pesto). I am also a sucker for gnocchi. 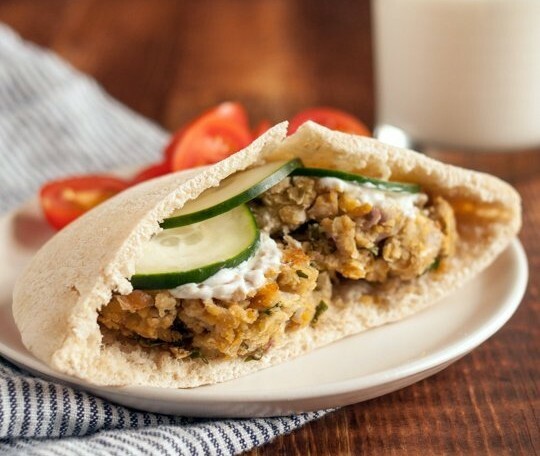 Baked falafel takes a little assembly, but simply double the batch and enjoy leftovers for the next couple of days. 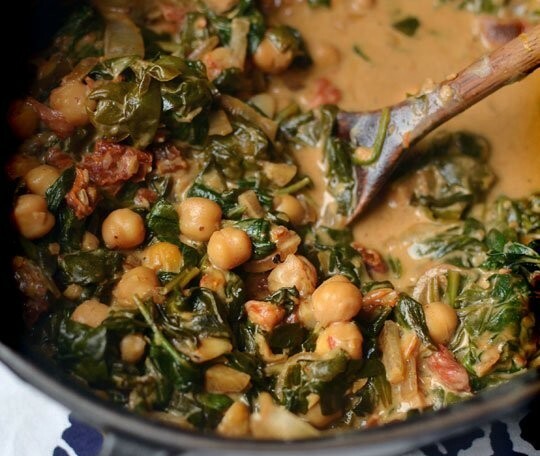 I could make this chickpea and spinach dish in my sleep, we’ve had it so many times. Similar improvised curries are a weekly dish at our house. This is currently my favorite combination of spices to use, and then I throw a bunch of veggies in—zucchini, tomato, onion, broccoli, you name it. Here’s another spicy version which uses curry paste. 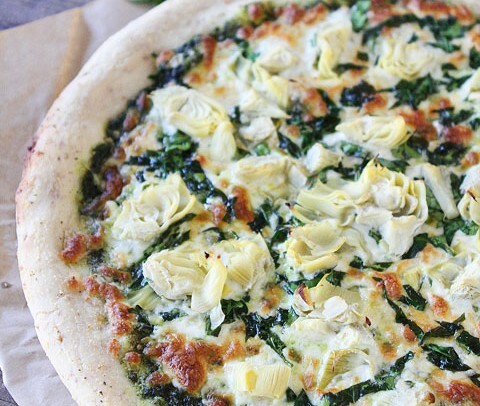 Pizza is an easy weeknight meal, just pile on the greens! Or this caprese pizza looks amazing. 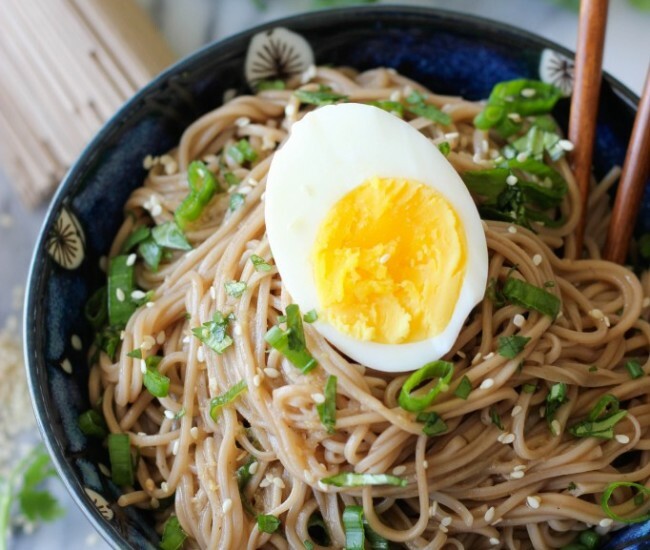 Soba noodles get rotated into our meal plan often, since they take all of 4 minutes to cook. We like sesame oil dressing or peanut sauce (my favorite is the sauce from this recipe). With the return of warm weather I’m ready for light, fresh, summery dishes. 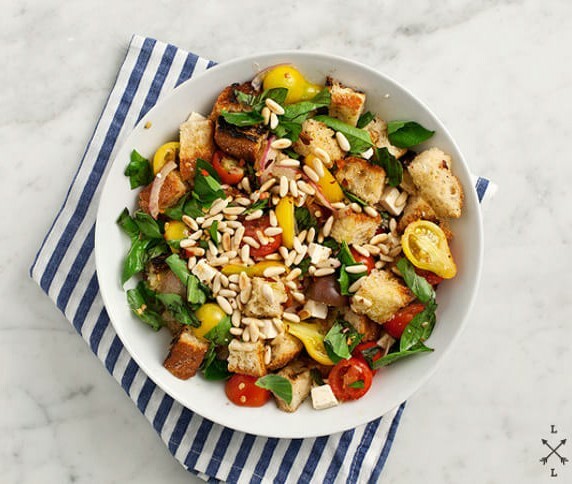 If you’ve got good bread, try some Grilled Panzanella. Another simple combination is couscous with vegetables, whether grilled or roasted or sauteed. And remember, you can always put an egg on it. 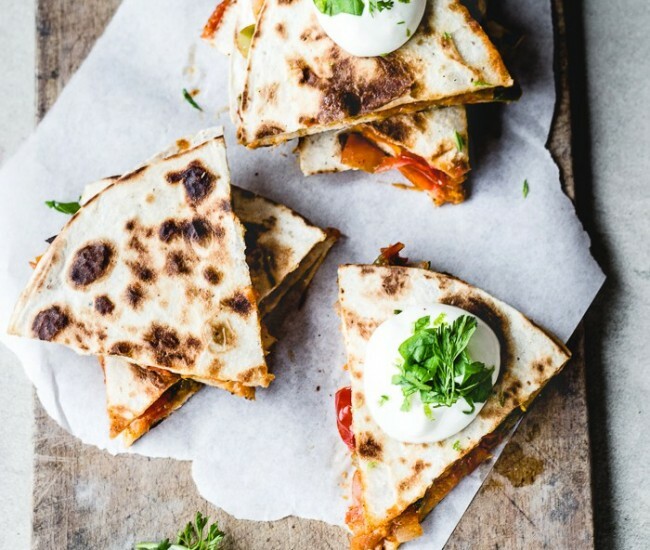 Quesadillas definitely do not have to be boring. 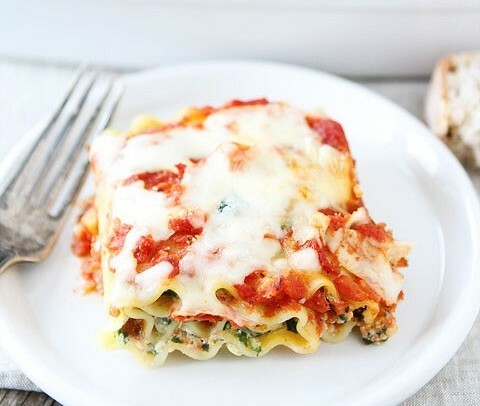 Lasagna roll-ups or stuffed shells, which can also be made ahead of time and kept in the freezer. You can keep this list handy for the next time Lent rolls around as well. I’m always on the lookout for new meatless recipes – share your favorites in the comments!